Video game packaging refers to the physical storage of the contents of a PC or console game, both for safekeeping and shop display. In the past, a number of materials and packaging designs were used, mostly paperboard or plastic. Today, most console and PC games are shipped in (CD) jewel cases or (DVD) keep cases, with little differences between them. Aside from the actual game, many items may be included inside, such as an instruction booklet, teasers of upcoming games, subscription offers to magazines, other advertisements, or any hardware that may be needed for any extra features of the game. Early machines such as the Commodore 64 were tape-based, and hence had their games distributed on ordinary cassettes. When more advanced machines moved to floppy disks, the cassette boxes stayed in use for a while (e.g. Treasure Island Dizzy for the Amiga came on a floppy disk in a cassette box). In the late 1980s and early 1990s, computer games became significantly more complex, and the market for them expanded enormously. Possibly in an effort to occupy more shelf-space than their rivals, and attract attention with their cover art, games began to be sold in large cardboard boxes. There was no standard size, but most were around 20 cm x 15 cm x 5 cm (around 8in x 6in x 2in). The greatly increasing box sizes may have been justified in some cases. Games such as flight simulators came with extremely large, thick manuals. Others came with elaborate copy-protection systems such as Zool's circular code wheel, or even a hardware dongle (although these were generally more common on expensive non-game software). Variations on the "big box" format include a box within a sleeve, such as Unreal, and a box with a fold-out front cover, such as Black & White. Games re-released as budget games usually came in much smaller boxes—a common format for Amiga budget games was a thin square box roughly 13 cm x 13 cm x 2 cm (roughly 5in x 5in x 1in). It was during this time that covermounting of cassettes and floppy discs became common. As PC games migrated to CDs in jewel cases, the large format box remained, though to reduce printing costs, manuals came on the CD as well as with the CD (inside the front cover), as did many of the copy-protection techniques in the form of SafeDisc and SecuROM. Despite the CD jewel case format having been around since the invention of the music CD, very few full-price PC games were released in a jewel case only. A thicker variation with space for a thick manual was, however, used for most PlayStation and Dreamcast games. Around 2000, PC game packaging in Europe began to converge with that of PS2 (and later, Xbox and Nintendo GameCube) console games, in the keep case format in which to this day the vast majority of games are sold. These boxes are sometimes known as Amaray cases, after a popular manufacturer of them. In the U.S., most PC games continue to ship in plastic DVD cases or cardboard boxes, though the size of such boxes has been standardized to a small form factor. Special packages such as a "Collector's Edition" frequently still ship with oversized boxes, or those with a different material, such as a "Steelbook". In the U.S., the IEMA played a major role in improving, from a retailer's perspective, the way most PC games are packaged. In 2000, many retailers were becoming disenchanted with the salability of PC games as compared with their more profitable console game counterparts as products. Oversized software boxes were blamed for a lack of productivity per square foot (the profitability of a particular item sold at retail based upon its foot print). The IEMA worked with leading game publishers in creating the now-standard IEMA-sized box, essentially a double-thick DVD-sized plastic or cardboard box, which effectively increased the profitability per square foot by over 33% and appeased merchants and developers alike. 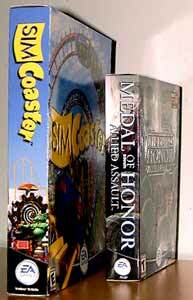 Medal of Honor: Allied Assault was one of the first PC games in the U.S. to come packaged in this new standardized box. In creating the new box size the IEMA found itself in the unlikely position of platform guardian (where each console platform had a first-party publisher to oversee standardization matters, PC games by their very nature did not). As such, the industry pressured the organization to develop a platform identification mark which would unify the display and focus the customer's brand perception. Again the IEMA worked with publishers to create a new standard "PC" icon, and would provide its use on a royalty-free basis to the industry. In 2004, Half-Life 2 was made available for download over the Internet, via Steam. A physical boxed copy was also sold, though it also required activation over the Internet. Valve Corporation hoped this method of distribution would take off, as it delivers a greater percentage of the sale price to the game developer than boxed copies. Valve's belief was not unfounded, as Steam became the most common method of PC game distribution by late 2009: even earlier, internet distribution surpassed physical, and as of mid-2011 is unchallenged. Many, if not most games by most publishers for the PC, not only Valve, are released as "Steam" electronic copies which regularly outsell physical copies. In addition, Steam's DRM remains one of the most secure available, but is very non-intrusive compared to schemes like SecuROM, which, in installing kernel-mode drivers (often somewhat inaccurately referred to as "rootkits"), are often incompatible with certain hardware configurations and many pieces of third-party security software (such as software firewalls and anti-virus applications), a problem that does not plague Steam. Steam also allows consumers to back up their copy of Half-Life 2 as well as other games that are downloadable through Steam onto CDs or DVDs. To complement this feature many fans have created box coverings for jewel cases that can be downloaded and printed, giving birth to a wide variety of game packaging styles and designs. Java games for cellphones are distributed almost exclusively via the internet. It is possible that the proliferation of home broadband will lead to electronic distribution for all games in the future, leaving physical packaging a niche market, though game developers cite the unsolved problem of digital rights management as the main barrier to this. The earliest consoles had game cartridges; the Intellivision cartridge packaging featured a box color-coded to the "network" or category of the game (one of several themes, such as "action", "sports", etc.). The front cover opened up, book style; on the inner front cover, a slot retained the paper manual – a simple booklet, as well as the poly controller overlays. In the main confines of the box, a plastic tray was recessed into which the cartridge fit snugly. When other companies began to produce cartridges for Mattel's system, other types of boxes began to appear, such as Imagic's simple cardboard box, which opened from the top to reveal simple cardboard retainers for the cartridge and rules booklet. Unlike PC games, console manufacturers charge a license fee to anyone developing for their machine, and exert a certain amount of influence in the style of packaging. Nintendo, for example, maintained almost completely standardized boxes for SNES games. PlayStation 2, Nintendo GameCube, and Xbox game boxes also conform to the keep case form factor. All cases of PAL region games for PlayStation and Dreamcast are thicker than standard North American and Japanese CD-cases. This is due to thicker manuals that often include many European languages. An exception to this were Australian-market PlayStation games later in the console's life, which were released in standard-sized jewel cases with the manual in English only. Games for handheld systems are usually packaged in smaller boxes, to match the portable nature of the machine. The Game Boy Advance's cardboard boxes are a little smaller than SNES/N64 packaging, and games for the Nintendo DS and PSP both come in smaller, CD-like cases. While DVD-like boxes are common in the current generation of gaming, the original cardboard packaging used for past cartridge-based games is scarce, as they were often discarded by the original owner of the game. As such, many cartridge-based games bought in second hand markets often are missing their original boxes, and the boxes themselves are now viewed as collector items. PlayStation 3 games are packaged into Blu-ray keep cases. With some generations, standardised colours have been used for the edging. The term box art (also called a game cover or cover art) can refer to the artwork on the front of PC or console game packaging. Box art is usually flashy and bombastic, in the vein of movie posters, and serves a similar purpose. Additionally, screenshots on the back of the box often mix in-game sequences with pre-rendered sections. Historically, art featured on the box has been in excess of what the computer or console was technically capable of displaying. Veteran San Francisco box art illustrator Marc Ericksen, who produced nearly 100 illustrations for video games from 1982 to 2003, including games like Tengen's Tetris, Capcom's Megaman 2, Atari 7800's Galaga, Data East's Bad Dudes, and SNK's Guerrilla War contends that there was very little in the screen graphics to sell the games. The sales arms needed illustrations to introduce a visual construct to acquaint young gamers to the gameplay concepts. The graphics were exciting when in motion, but offered very little to engage a prospective purchaser's attention when static. Illustrators were less frequently required beyond the year 2000, when screen graphics reached parity with illustrations and could be utilized as cover art. Box art may misleadingly depict gameplay. Weekly Reader Software in 1983 advertised Old Ironsides with the slogan "What you see is what you get! ", promising that "Unlike other programs, where the pictures on the packaging and in the advertising bear no resemblance to the screen images, this program delivers precisely what's promised ... Better than arcade-quality graphics and sound!". Cinemaware advertised Defender of the Crown in 1987 with screenshots that the company described as being an "Actual Atari ST screen! ", "Actual Apple IIGS screen! ", "Actual Macintosh screen! ", and "Actual Commodore 64 screen!". Deceptions continued, however; Computer Gaming World in 1994 stated that "Careful consumers have learned to spot screen shots on a box that are probably just animation sequences, not really a play shot". On the cover, many things are listed, such as the name and logo of the game, what platform the game is for, the rating (ESRB for North America, PEGI for Europe and CERO for Japan), logo of the publisher and/or developer, and quotes from magazines or websites. As part of the marketing effort to build hype, box art is usually released a few months before the actual game. The box art for Phalanx is notable for its unusual art design. Many people[who?] find particular box art strange, or poor, such as Phalanx and Mega Man. Often this is the result of art used for a localized version of an import title. Many early releases, especially Nintendo, replaced Japanese art with original US artwork, such as the Dragon Warrior and the Final Fantasy series. Recent import titles have made it a habit to retain the original cover art. The boxes of Nintendo games (NES, Game Boy, Nintendo 64, Nintendo GameCube, Nintendo DS, Wii, Nintendo 3DS and Wii U) from PAL territories all have a small coloured triangle on their spines, but in each territory it's a different colour (to show the region that copy of the game came from). Some common ones are: Green = UK, Pink = Spain, Red = France, Light Blue = Italy, Dark Blue = Germany, Brown = Australia. There are 49 different colours. As well as geographic region it also has to do with the language of the box art and booklets; though PAL region Nintendo games are made in Germany, the triangles show the region that the game is shipped to. An instruction manual, a booklet that instructs the player on how to play the game, is usually included as part of a video game package. Manuals can be large, such as the Civilization II manual which runs hundreds of pages, or small, such as the single sheet of double-sided A5 paper included with Half-Life 2. PAL region versions of games may include thick manuals with many languages. For example, the European manual of Crash Bandicoot 3: Warped for PlayStation includes six languages: English, French, German, Italian, Spanish and Dutch. Computer games typically have larger manuals because some genres native to personal computers such as simulators or strategy games require a more in-depth explanation of the interface and game mechanics. Furthermore, instruction manuals for personal computer games tend to include installation instructions to assist a user in installing the game, but those instructions could also appear in a separate piece of paper or in a different leaflet. As some of these manuals are so large as to be cumbersome when searching for a specific section, some games include a quick reference card (usually a list of keyboard commands) on a separate sheet of paper or in the back cover of the manual. A common use for printed manuals until the CD-ROM became the main medium for games was to use it as a copy protection device: some games required the player to find the "word x in the yth paragraph of the zth page" or to input a code found in the borders of a certain page. These mechanisms were highly unpopular, as they only affected legitimate purchasers; pirates would simply use a crack or have the codes printed on a single sheet to bypass the mechanism. While this practice has fallen out of use in recent years, CD-keys serve a similar purpose and are occasionally printed somewhere in or on the manual. Other manuals go much farther than being simple guides: some games based on historical or well developed fictional stories often include extensive information about the settings, like WWI combat simulator Flying Corps, where every campaign was thoroughly described with historical information. In some genres, this led to the aforementioned large manuals traditional with computer games. The trend in recent years is towards smaller manuals – sometimes just a single instruction sheet – for a number of reasons. Console games are no longer sold in large cardboard boxes; instead, since the early 2000s, DVD cases have been used (as today's major consoles use DVD sized optical discs), which leave no room for a large manual. Printing is also expensive, and game publishers can save money by including a PDF of the manual on the disc (for PC games). Notably, most video games produced during and after the fourth generation include in-game instructions via tutorials and other such methods, meaning printed manuals are often overlooked. However, this trend is unpopular among many video game collectors because it may decrease the perceived value of game, as manuals are sometimes considered works of art themselves as an essential part of the game's packaging. Some consider reading manuals an enjoyable experience. Also, reading manuals on a computer monitor or other display device may be considered more "awkward" as opposed to printed paper. As opposed to most console games which have printed manuals, games for the Nintendo 3DS, PlayStation Vita and Wii U store manuals in digital form on the Nintendo 3DS game card, PlayStation Vita game card and Wii U optical disc respectively. 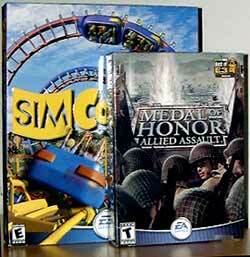 While their use in PC games post-2000 is scarce, console games and older PC games are expected to have them. Games acquired in second hand markets often miss the manuals, much like missing their original boxes, after being kept, lost or discarded by their previous owners. As occasionally the manuals are part of the game experience, owners of games missing manuals try to find replacements in other second-hand stores or with other players or collectors. Alternatively, sites like Replacementdocs provide a large repository of fan-made and official PDF manuals to download. Those range from simple page scans (which is impractical in longer manuals, due to larger file size and the inability to search text) to OCR-scanned and carefully assembled manuals to remain as close to the original manuals as possible. MMORPGs in particular continue to be packaged with a comprehensive and high-quality manual. World of Warcraft and Guild Wars include instruction manuals that are 150 to 200 pages; they explain everything from in-game lore to detailed overviews of the different character classes. In general, MMORPGs have a larger variety of features in which the player can focus on while playing than normal games and often take much longer to semi-complete (usually defined as reaching the highest-possible character level: due to the nature of MMORPG games, with constant content additions, etc., requiring many hours of weekly play in order to stay competitive in-game, it is impossible to ever "complete" or "finish" or "beat" one in the traditional sense one can complete a game like Final Fantasy X or Rome: Total War). The detailed instruction booklets that accompany the games help answer any questions that players may have in order to make public relations and technical support easier once the game is released. These manuals also invite potential players to explore an aspect of the game that was previously unknown to them. More than any other genre, the community and longevity of an MMO are important to the developers because they often charge a monthly fee for playing the game. ^ "New Standard For PC Game Boxes! - Airliners.net". 28 August 2018. Archived from the original on 2018-08-28. ^ "EA stapt volledig op 'DVD-hoesjes' over - Gamersnet.nl". 17 January 2002. ^ "The Ultimate Resource for Combat Simulation and Strategy Gamers. (www.combatsim.com)". www.combatsim.com. ^ "EA's Medal of Honor Allied Assault to Debut with New Packaging for PC Games; Videogame Industry to Follow with Newly Adopted Standard for PC Games. - Free Online Library". www.thefreelibrary.com. ^ a b c "Eyestrain". Softline. January 1983. p. 48. Retrieved 27 July 2014. ^ "All hands on deck". Softline. March 1983. p. 13. Retrieved 28 July 2014. ^ "To the Victor Go the Spoils". Computer Gaming World (advertisement). March 1987. p. 15. ^ "Gaming Intelligence Agency - Awful Box Art Competition". thegia.com. Archived from the original on 27 June 2001. Retrieved 29 July 2015. ^ "GenGAME Wii U Games Will Include 'eManuals'". GenGAME. Retrieved 29 July 2015. This page was last edited on 21 January 2019, at 09:39 (UTC).